Each item will be wrapped in old time brown paper with a tan hemp bow. I will hand write a small card with To/From with your special message. 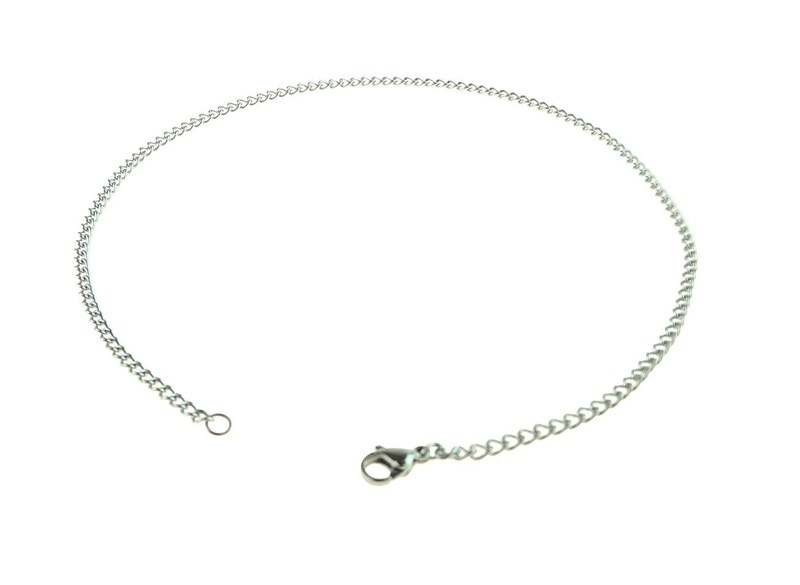 This 14 inch (35.5cm) long stainless steel curb chain and lobster claw clasp is perfect for any pendant. It is durable, tarnish resistant and never needs polish. Last image shows different lengths and how they look. Please note that lengths will vary on each individual. Is the length you need not listed? Feel free to ask about custom lengths! Want it faster? Use the Priority Mail Upgrade at checkout! Super high quality chain, really beautiful. Fast shipping! Currently I accept payment via all major credit cards via Direct Checkout and PayPal. If for any reason you are not satisfied with your purchase within the first 15 days return it for a full refund of purchase price(minus original shipping.) You must e-mail me before shipping package back. Purchaser is responsible for return postage. After 15 days you may return any item purchased for in-store credit only. After 30 days no items may be returned for refund or credit. Items marked "One of a Kind" or "OOAK" or "Custom" or "Closeout" may be returned within 30 days of purchase for in-store credit only. All Tangled Metal/Sleeping Knight items are guarantied for life (Limited to my life) and may be returned for repair or replacement at any time. Please contact me ahead of time to make arrangements. Purchaser is responsible for shipment back to me for repair. I will handle the shipping back to you. I generally ship within 48 hours of purchase. That is 48 business hours. I sometimes will ship on a Saturday but it is not guaranteed. I do not ship on Sundays or US Federal Holidays as the Post Office is closed on those days. I do not purchase and or print mailing labels until the item is ready to ship. That means if you purchase an item on Thursday or Friday on a Holiday weekend it may be Tuesday or even Wednesday before your purchase will actually ship. I do all that I can to make this a RARE exception but sometimes it happens that way, especially during the Holiday Season. If you have a deadline please use Priority Shipping and contact me to let me know you need the item to be rushed. I do not offer Express mail. Shipping is done through the United States Postal Service only. Items are shipped First Class Mail unless otherwise noted or upgraded to Priority Mail. Everything is shipped with delivery confirmation and a tracking number will be sent once the shipping label has been printed. Insurance is not included on any items. Priority Mail is available to most US addresses and include $50 insurance. There is a link to Priority Mail upgrades in each listing when available. If more than $50 insurance is needed please contact me ahead of time to make the proper changes to the listing. I have no control over International Customs and cannot be held responsible if your package is held. I will provide the best tracking available to me but once the package is outside of the US it may become untrackable in some cases.. Items are shipped as Merchandise with the actual declared value only, no exceptions. All duty and tax is paid by the buyer- no exceptions. In the event that you are unhappy with your product from Tangled Metal you must return the item(s) within 14 days of delivery to you. Buyer is responsible for return postage to Tangled Metal. Postage from the UK to the US varies and Tangled Metal is not responsible for these charges. The buyer is responsible fr but not limited to original price of item stated in Tangled Metal's shop, applicable taxes, customs fees and any other fee inured by purchasing from Tangled Metal. Tangled Metal will put the actual item in the customs forms with the original price.Under no circumstance will Tangled Metal falsify customs form by not adding quantity, changing description or altering purchase price. No Exceptions. All delivery times are estimated to the best of the ability of Tangled Metal. Times are based solely on experience and are by no means a promise of deliver on a specific date. Sometime it is possible that Customs will hold an item. The hold times range from 1 day to 6 weeks. Tangled Metal has no control over these circumstances. Tracking information is provided for you convenience but still are just estimates of delivery time. On occasion the US Postal System stops tracking items once they leave USA borders. Tangled Metal has no control over what the US Postal System does or does not provide in the way of tracking. 1. Will you custom fit my order? Yes, I would be happy to make sure that any item you purchase is modified to fit before I ship it out. Most items are made "average" size and have a list of measurements in the description. I'm sorry, but I cannot modify a bracelet to fit your neck. Yes, I would be happy to create anything you like. I generally require a 50% deposit on all custom orders. 3. Do you do wholesale? Yes, I do wholesale. I do have minimum orders for wholesale. If you have a physical shop and would like to inquire about wholesale please feel free to email me. 4. Do you do consignment? As a general rule I only do consignment in shops in Eureka Springs, Arkansas or with friends who own brick and mortar shops. 5. What guarantees do you offer? 6. What type of warranty do you offer on your items? If it breaks because of something I did or didn't do I will repair it free of charge. If it breaks because of something you did or didn't do I will still repair it but it will cost. Don't see exactly what you are looking for? Contact me and I will create an item specially just for you. Don't see the size you need? Contact me so that I may create something that fits your needs perfectly. Most items can be washed with normal soap and water. However, some items need special care. If in doubt contact me about how to care for your special item. Need your item gift wrapped? Let me know in the notes section and I will happily wrap it for you. If you need a note for the recipient I can add that as well. Always FREE of charge. I do offer wholesale discounts for large orders as long as you have a resale Tax ID. Feel free to contact me for more details.